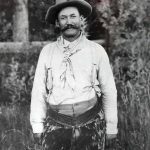 Elko, Nev-Paula Bear Wright had aspirations of creating a cowboy art and gear museum to preserve the cowboy and vaquero heritage for generations to come. Her son John Wright and daughter in-law Susan are helping to see that dream brought to life with the help of NV Energy, Jan Petersen, museum director who did the leg work to get the museum its 501-C status, and board members Mike and Tana Gallagher. 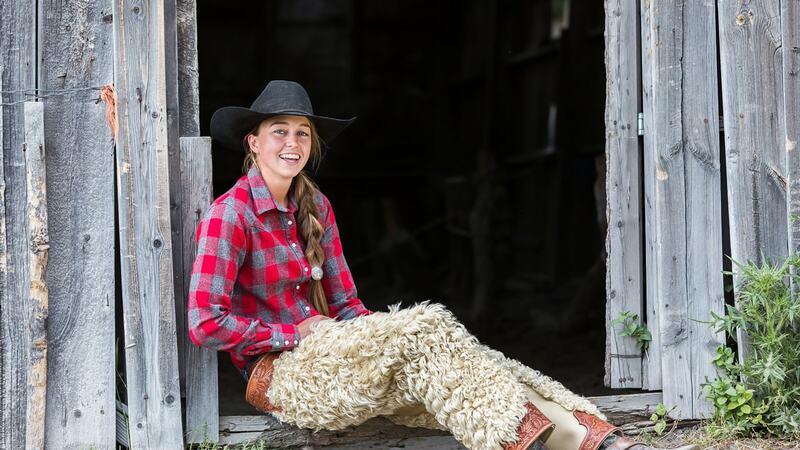 Elko has not only a unique ranching and cowboy heritage, but also a unique gear making heritage as well. A museum that showcases these unique heritages is a must have. 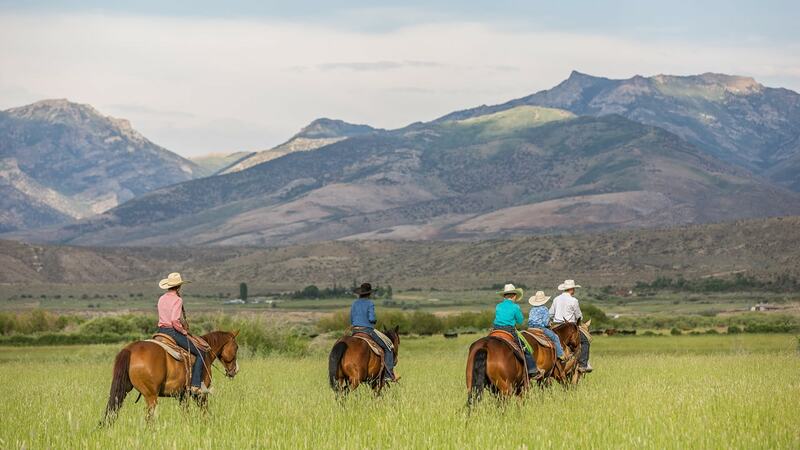 The Wright family has put together a team of determined individuals to ensure that the legacy of cowboys and gear makers live on for future generations to learn about and enjoy. The former NV Energy building at 542 Commercial Street has a rich history. It was built and purchased by G.S. Garcia to be both a family home and storefront for his booming saddle and harness business. It was built in 1907 on Silver Street in Elko. In 1913 G.S. Garcia purchased a lot on Commercial Street and moved the building there. The building had to be cut in half from front to back before it could be moved from Silver Street to the Commercial Street location. 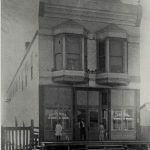 In May of 1924, a fire broke out next door at 515 Commercial Street and threatened the Garcia Harness and Saddle Shop. Fire didn’t damage the building, but it suffered significant water damage to the basement and saddles and stock items stored there. In December 1938, G.S. Garcia’s family decided to close the Elko store and move their business to Salinas, Ca. NV Energy knew the historic value of their Commercial Street property and wanted to see it preserved. A chance meeting with the Wright family at a branding in Tuscarora made it all happen. The building has a lot of historic potential and the Wright family with the help of Cowboy Arts and Gear Museum director Jan Petersen have some great ideas. 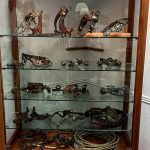 The Cowboy Arts and Gear Museum plans to have a wide selection of Made in Nevada items for sale and to host instructors as they put on classes to teach people about gear making and fine art. They also plan to have kid’s leather tooling kits for purchase to inspire children to start a leather working hobby while their parents peruse the museum. Other plans include a meeting room for groups to meet at, and a branding iron fundraiser for ranchers to permanently display their family brands in the museum. First they have plans to remodel the building to resemble its original glory. One of the show pieces of the museum is the Chevalier saddle and matching gear, built by G.S. Garcia in 1916 for Pete Chevalier who ordered it as a wedding gift for his bride Marie Bernard Chevalier. It is very similar to the 1904 World’s Fair saddle, known as “Garcia Beauty” on display in Carson City, Nevada. 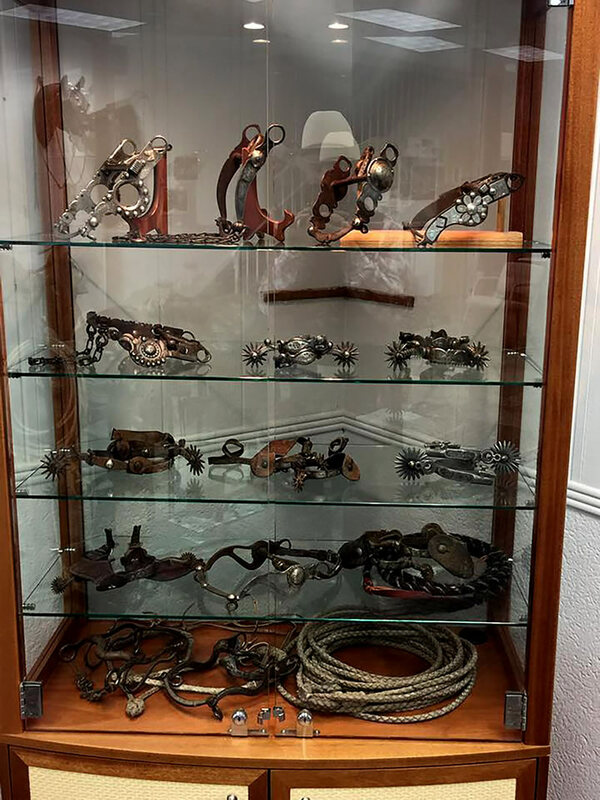 Mr. Chevalier wanted to “to encourage her to learn to ride and be available when an extra rider was needed on the ranch.” Chevalier ordered silver work for the saddle as seen on display in Garcia’s store. There are six silver conchos on the inside fork, the leather is stamped in the rose pattern, and the bit is elaborately designed and overlaid in silver. The set includes headstall, bit, saddle, and martingale. Garcia gifted Madame Chevalier with a matching pair of Garcia spurs to compliment her new outfit. The saddle and matching gear are on loan from the Steve McDermott family of Lamoille, Nevada, and definitely worth seeing. The Chevalier gear adorns the gray Capriola Horse who is also a showcase item for the museum. He was built in 1904 to model the Garcia Beauty saddle which was designed to be Garcia’s entry in the 1904 St. Louis World’s Fair. It is adorned with the American Beauty rose pattern, silver, gold, diamonds, and rubies. The saddle won first prize, a gold medal. 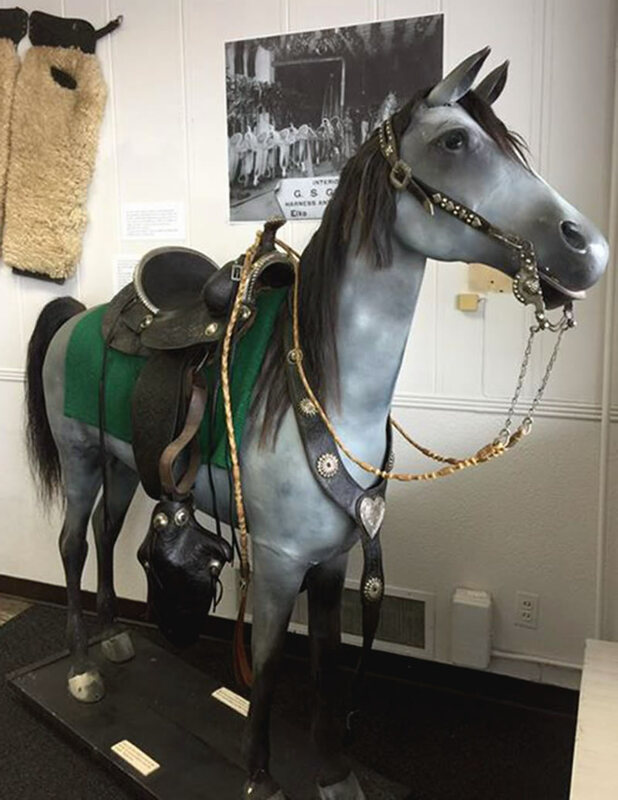 Several Nevada governors have ridden the saddle and it is on display in Carson City. 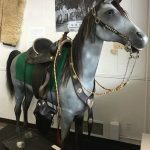 The saddle will make its way back to Elko to be displayed in the Northeastern Nevada Museum later this year. The horse has changed from gray to black and now back to gray and is complete with a real horse tail and horsehair mane. He spent some time in Salinas, California when the Garcia family moved their business there, but now is back in Elko to stay. 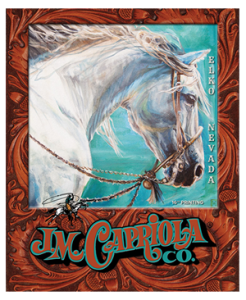 The Cowboy Arts and Gear Museum is working with the Northeastern Nevada Museum, The Western Folklife Center, California Trail and Interpretative Center, and JM Capriola’s to promote tourism in Elko. They are actively seeking donations for building upkeep, remodel, and maintenance. They are also seeking loans of antique gear and tack to display in the museum. The museum is open Fridays and Saturdays through the end of May, and will close for the summer to remodel. They plan to reopen full time in October of 2017. If you are interested in donating, or loaning gear please contact Jan Petersen at 775-778-5478 or janpetersen@citlink.net. Photo 1 (Wright Family): The new G.S. 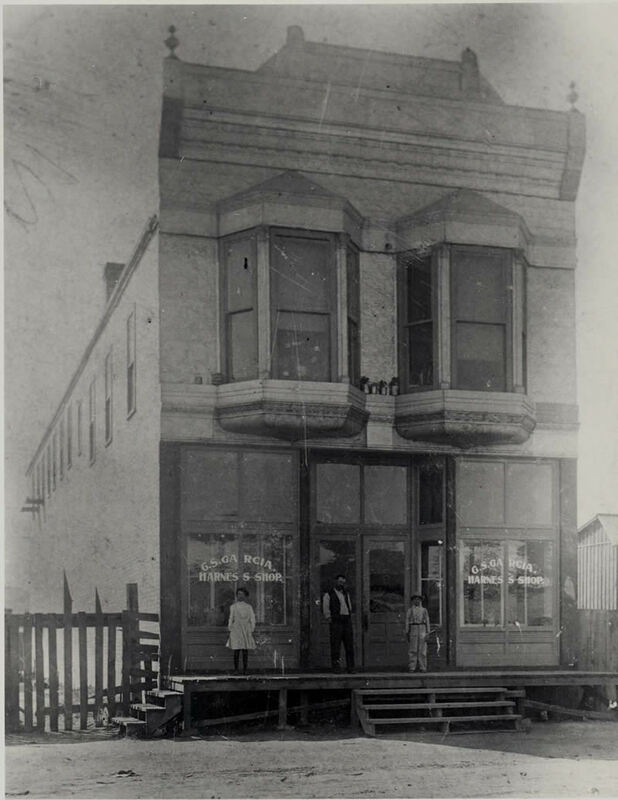 Garcia Harness and Saddle Shop building on Silver Street in Elko, July of 1908. Standing on the porch, left to right is Garcia’s oldest daughter Margarita, G.S., and second to the oldest son Leslie. The family lived upstairs and the Harness and Saddle Shop were on the ground level. 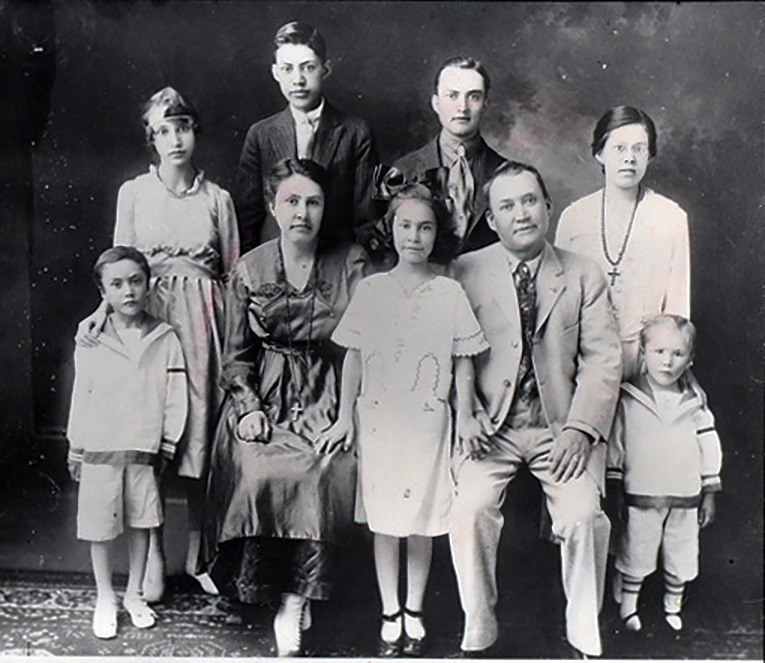 Photo 2 (Wright Family): The Garcia family, back row, left to right: Audelina, Leslie, Walter, and Margarita Garcia. Front row, left to right: Henry, Saturnina, Vickey, G.S., and Eddie Garcia. 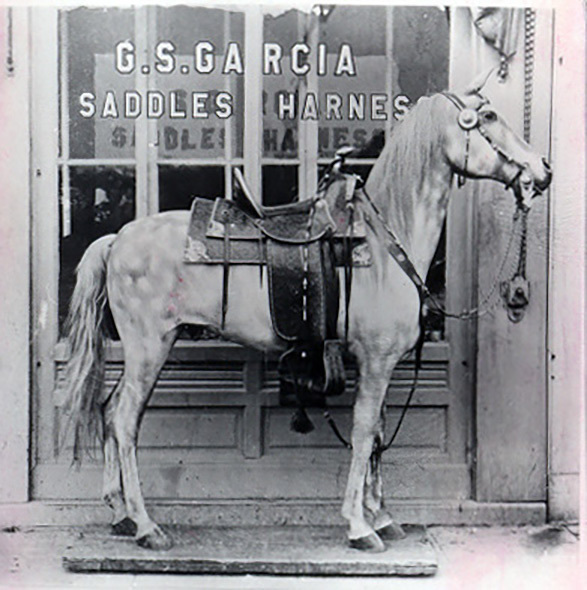 Photo 3 (Wright Family): The original Garcia horse modeling the Garcia Beauty saddle and matching gear outside the G.S. 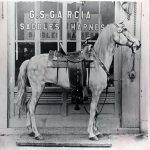 Garcia Harness and Saddle Shop. 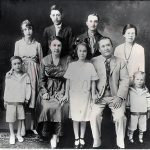 Photo 4 (Wright Family): G.S. 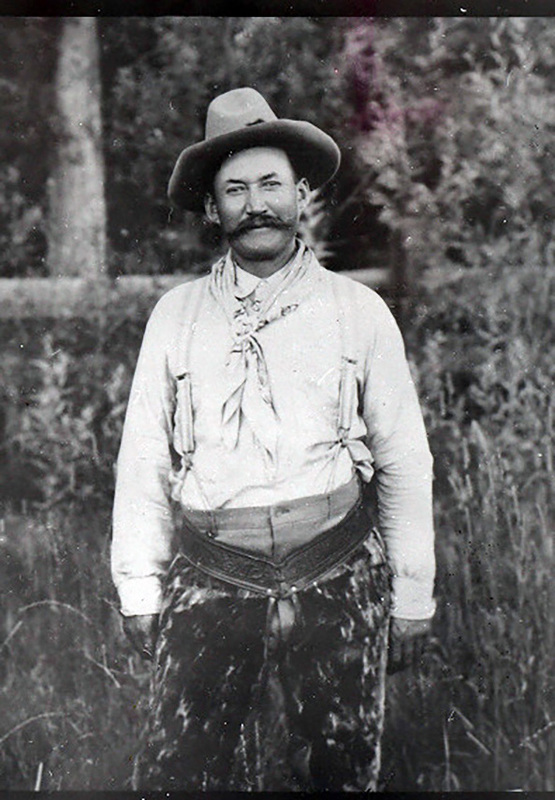 Garcia wears a pair of wooly chaps he made for the 1913 Elko Rodeo. Garcia and his wife remembered fondly the large fiestas of their youth and the sense of community and pleasure they afforded all who attended them. They strove to recreate that sense of community and began putting on rodeos in 1912. Those rodeos were the precursors of the Silver State Stampede. Photo 5 (Wright Family): The Garcia horse was restored by Claudia Riordan in the 1980’s. Today he models the Madame Chevalier saddle and matching gear where he greets all who enter the Cowboy Arts and Gear Museum. Photo 6 (Wright Family): Just a small sampling of some of the bits and tack on display in the Cowboy Arts and Gear Museum.